Munir Associates is sole authorised representative of Eriez Magnetics in Pakistan. Suspended magnets are used in a wide range of applications, hence the need for an array of both permanent and electromagnetic designs. Suspended Permanent Magnets use ceramic magnetic material arranged in a very specific pattern to create a powerful magnetic field. Each model is designed for the application based on conveyor width and speed, material burden depth as well as the density or frequency of tramp iron present in the process. The magnets are permanently charged so they require no external power source to function. 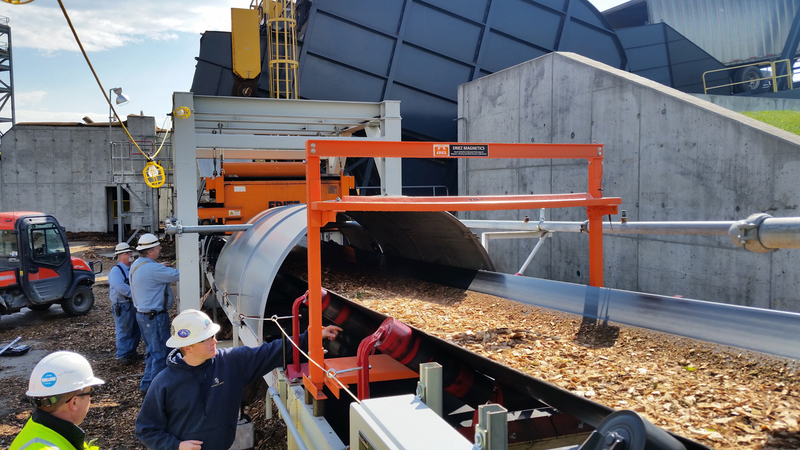 Typical applications involve light industrial applications like wood, tire chips or light aggregate recycling. For larger industrial separation applications, an electromagnetic separator may be required. The popular round-core electromagnet uses round aluminum or copper wire in an oil-filled assembly to generate a powerful electromagnetic field. Eriez uses advanced, multidimensional finite element analysis to model each magnetic circuit ensuring optimum performance for each unique application. These electromagnets efficiently remove ferrous metals in heavy industrial applications like coal, limestone, sand and other aggregates. We offer a variety of electromagnetic configurations including oil and air-cooled; round and rectangular core; explosion proof; even cryogenic superconducting magnets capable of producing the world’s strongest magnetic force for separation applications. All MC models are cleaned of accumulated tramp iron by turning off magnet power periodically. 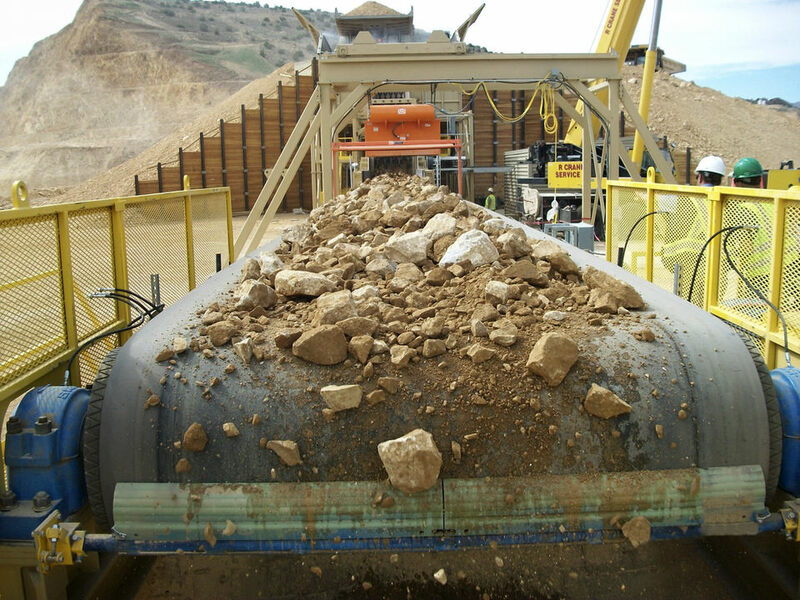 MC models are recommended when occasional pieces or small amounts of iron may contaminate material flow. SC models provide completely automatic iron removal and can be installed in an “in-line” or “cross belt” position. 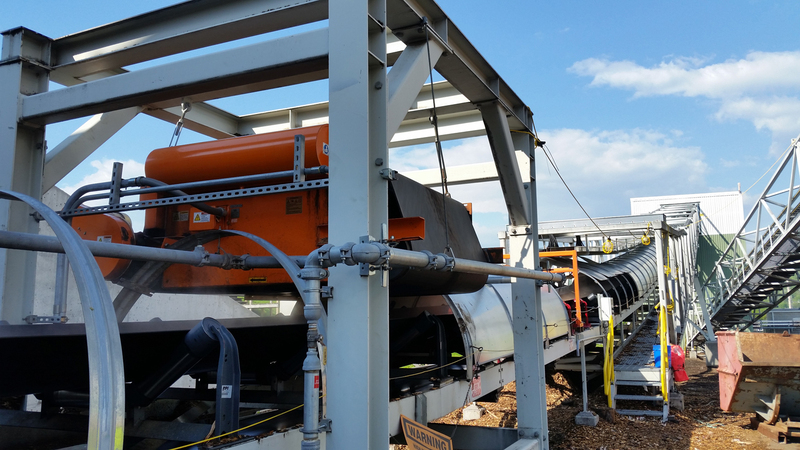 Both SC models have a short belt conveyor built around the magnet for automatic removal of tramp iron from the magnet face. This system features a rubber conveyor belt, bearings, rugged continuous channel frame, adjustable take-ups and shaft-mounted reducer with V-belt coupling to a TEFC motor. Belt Speed: As the belt speed increases, it becomes more difficult to remove ferrous components. Larger, stronger magnets may be required for faster belt speeds. Burden Depth: As the burden depth on the conveyor belt increases, an increase in the magnetic field strength is needed to pull the tramp iron up through the deeper burden. Ferrous Contaminant Size: Small pieces of tramp metal (i.e. 1/2″ hex nut, 1″ cube, etc.) may be extremely difficult to remove especially when they are covered by a heavy overburden of material, compared to large items like shovel teeth, rail spikes or rebar. Ferrous Contaminant Shape: Steel plate has a high surface area relative to its weight vs. a sphere which has the lowest surface area relative to its weight. Therefore, flat plates and rod shaped tramp metal are easier to remove than spherical or cube shaped tramp metal. 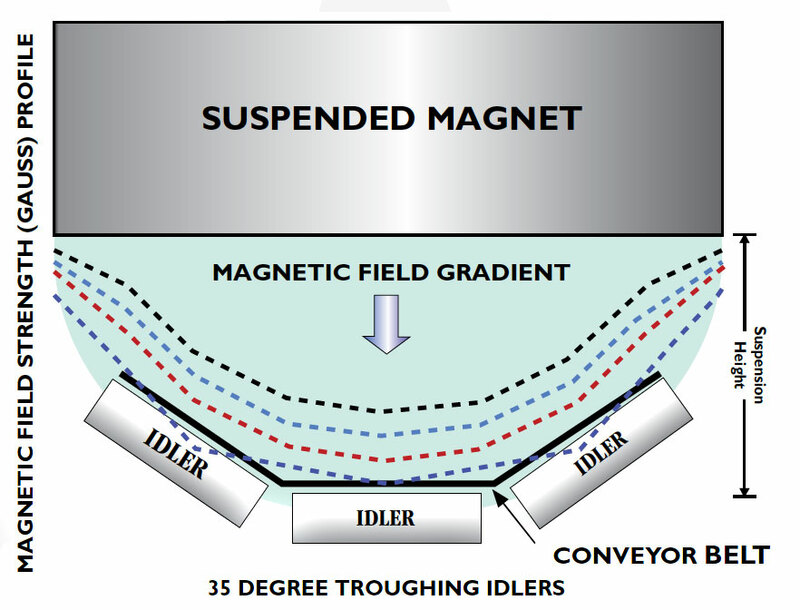 Typical magnetic field configuration of an electromagnet suspended over a conveyor belt. The magnetic field extends outward from the center of the magnet. The magnetic field is strongest at the center and diminishes towards the edges. This style unit consists of the magnet only. With manual-cleaning magnets, it is necessary to periodically remove the accumulated tramp iron either by hand picking or the optional mechanical stripper. 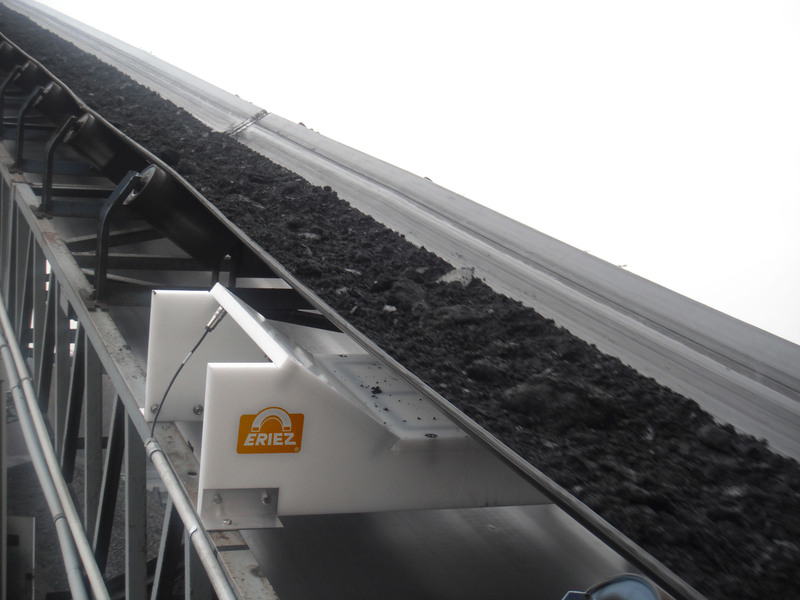 This unit consists of a short belt conveyor built around a magnet to provide self-cleaning. This unit is designed to be mounted in Position 1, as illustrated, at the head end of a conveyor either over the trajectory of the discharged material or over the head pulley. It provides automatic removal of tramp iron in the direction of the main conveyor travel. This style unit consists of Position 1 Self-Cleaning unit except the self-cleaning belt travels across the magnet face at right angles to the main conveyor, providing automatic tramp iron discharge perpendicular to the direction of the moving material burden. It is designed for mounting in Position 2, as illustrated, over a conveyor belt, picking table, vibrating screen etc.